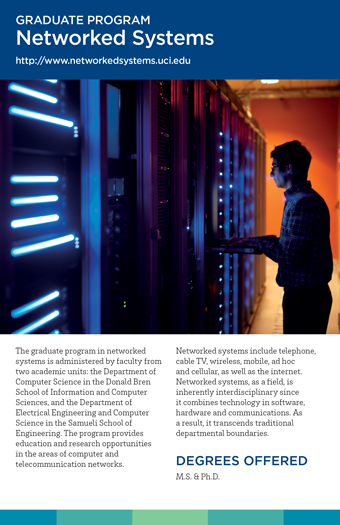 The graduate program in Networked Systems is administered by faculty from two academic units: the Department of Computer Science (CS) in the Donald Bren School of Information and Computer Sciences, and the Department of Electrical Engineering and Computer Science (EECS) in The Henry Samueli School of Engineering. The program offers M.S. and Ph.D. degrees in Networked Systems. The Networked Systems program provides education and research opportunities to graduate students in the areas of computer and telecommunication networks. Networked Systems include telephone, cable TV networks, wireless, mobile, ad hoc, and cellular phone networks, as well as the Internet. Networked Systems, as a field, is inherently interdisciplinary since it combines technology in software, hardware, and communications. As a result, it transcends traditional departmental boundaries. Networked Systems draws primarily from Computer Science, Computer Engineering, and Electrical Engineering. At UCI, these areas are housed in two departments: CS and EECS. The Networked Systems program unites the respective strengths of these two departments and provides integrated M.S. and Ph.D. degrees in this area. Program requirements include core, breadth, and concentration courses. Core courses are taken by all Networked Systems students and form a foundation for networking topics. Breadth courses may be selected from technical courses (including distributed systems, algorithms, data structures, operating systems, databases, random processes, and linear systems) and management and applications of technology (including educational technology, management of information technology, and social impact). Concentration courses may be selected from a long list including courses on networks, performance, middleware, communications, and operations research. Core, breadth, and concentration course lists are available on the Networked Systems website or from the Networked Systems Program Office.